Gold vs. Silver: Which is the Best Investment? Gold is a monetary asset, with supply and demand determined primarily by the condition of the currencies in which it is valued. 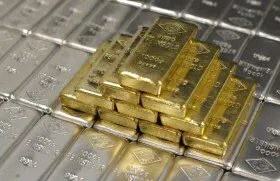 Because gold has few industrial uses, it can be seen as a mirror that reflects the value of the global monetary system. When gold is rising in price, it usually means that confidence in monetary authorities is falling and currencies are being devalued. Silver, on the other hand, is both a monetary and industrial asset. Like gold, silver has been used for thousands of years as currency and as backing for paper money. However, because silver also has many industrial uses it is affected both by monetary conditions and changes in the business cycle. Moreover, because silver is used in various industrial processes, above ground inventories are continuously depleted. In contrast, almost all the gold that was ever mined is stored somewhere on the planet. Clearly, they are quite different so there is an intuitive case for holding both – but is there an empirical case? [Looking at the correlation between gold and silver over a rolling 36 month period one can see in the chart below] that the correlation is high and fairly constant across time, suggesting that the diversification benefit of holding both gold and silver is limited. While gold’s rolling 12 month returns have remained somewhat steady during the analysis period, silver’s returns have ranged considerably [as can be seen in the chart below]. The graph below displays the difference between the two returns in the previous graph. This simply highlights the huge differences in returns experienced by gold and silver [which is anything but] consistent and predictable. Again, the following chart displays the returns differential in another way. Clearly, SLV introduces a lot of volatility (upside and downside) to a portfolio. The next two graphs look at the actual results of a back-tested pair trade. The final graph really sums up the story. There is a distinct indication that, since SLV’s inception, investors have not been compensated for adding silver to a gold portfolio. Based on the limited back test using SLV and GLD, in my opinion investors have been better compensated for risk by investing in 100% gold. 1. Economic/Currency Collapse Could Bring Martial Law and Confiscation of Your High-priced Gold! Got Silver? 2. Gold & Silver Warrants: What are They? Why Own Them? How are They Bought & Sold? 3. Do Recent Gold & Silver Correlation/Return Comparisons With S&P 500 Refute Their Safe Haven Status? 4. Where Do Gold & Silver Rank in Vulnerability to a Recession Among Other Commodities?